Koffee Mameya, which literally translates as Coffee Beans, is something of a name in speciality coffee circles. The successor to the famed Omotesando Koffee, a legendary pop-up coffee shop that once stood on the same physical site, going to Koffee Mameya is somewhat akin to going on a pilgrimage for the speciality coffee lover. Technically Koffee Mameya isn’t a coffee shop; it’s a retailer with a tasting bar where you can try the beans before you buy. It’s also tiny, an almost cube-shaped, wood-clad, windowless box with no seats, just a counter at the back and, more often than not, a queue out of the door. 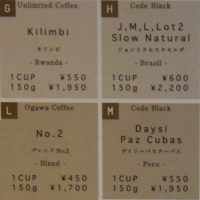 Koffee Mameya works with seven roasters, four from Japan and one each from Denmark, Hong Kong and Melbourne. There are up to 25 different beans available at any one time (there were 18 choices on offer when I visited) arranged by roast profile from light to dark. Since Koffee Mameya is all about the taste, there’s no milk here (and definitely no sugar), with the coffee available to try as either pour-over through the Kalita Wave or espresso, using a customised Synesso Hydra built into the counter-top. There are also cold-brew samples on hand.